Tonight's Apple event is still under way in Steve Jobs Theater in Apple Park but we've already got some news about, well, news. Apple's first new release was the updated Apple News, which offers new paid services for people who like to read newspapers. 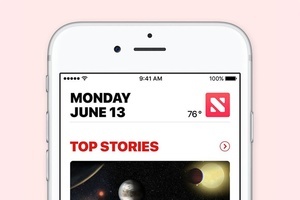 According to the company the improved Apple News will bring more, and more in-depth, content from leading papers. To acquire access to the best content on Apple News, you'll have to subscribe to Apple News+ which comes at a cost of $9.99 a month. You'll get more than 300 newspapers with the most exclusive content whether it is about fashion or politics. Articles have been customized to take use of touchscreens, including animations and other graphic elements. Apple News+ subscriber can share their subscription with their family for free and the service has a one month free trial. You can subscribe to Apple News+ starting today.